This is a brief pictorial update to my previous post. 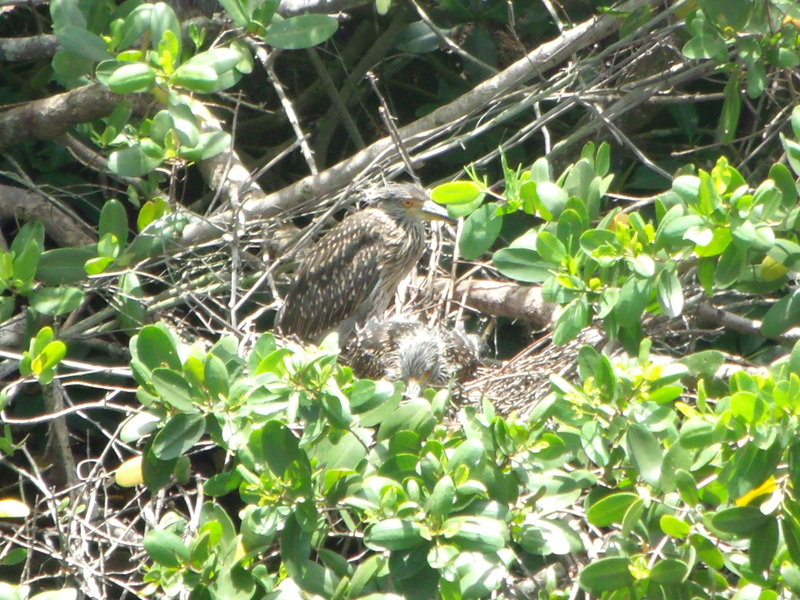 The baby Night Herons are exploring the world around their nests under mother’s watchful eye. They’re walking the twigs around their home base, chasing small lizards, and waiting impatiently for mom’s next delivery of partly digested fish. Where’s mom and the meal? Momma Heron keeping an eye on things! California has its Capistrano, Florida has its Barrancas Canal. Say you never heard of that second one? I’m sure you haven’t … it’s something I just made up, but describes an event that is becoming as dependable and, to me, as reassuring. 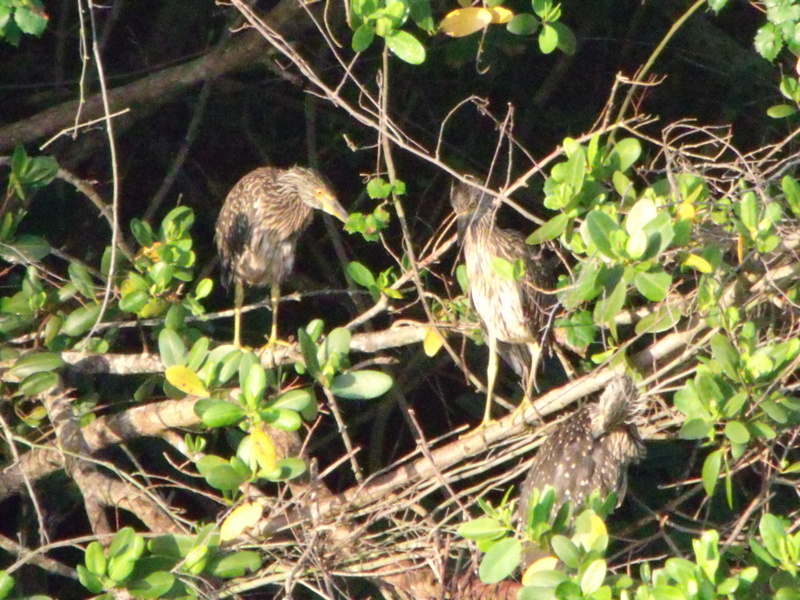 Four years ago was the first time I noticed a pair of Night Herons building their nest in the mangroves directly across the canal from our home. Mom and Dad Heron managed to construct the well camouflaged structure on the flimsy twigs that swayed in the breezes more like flags than the base for a residence. 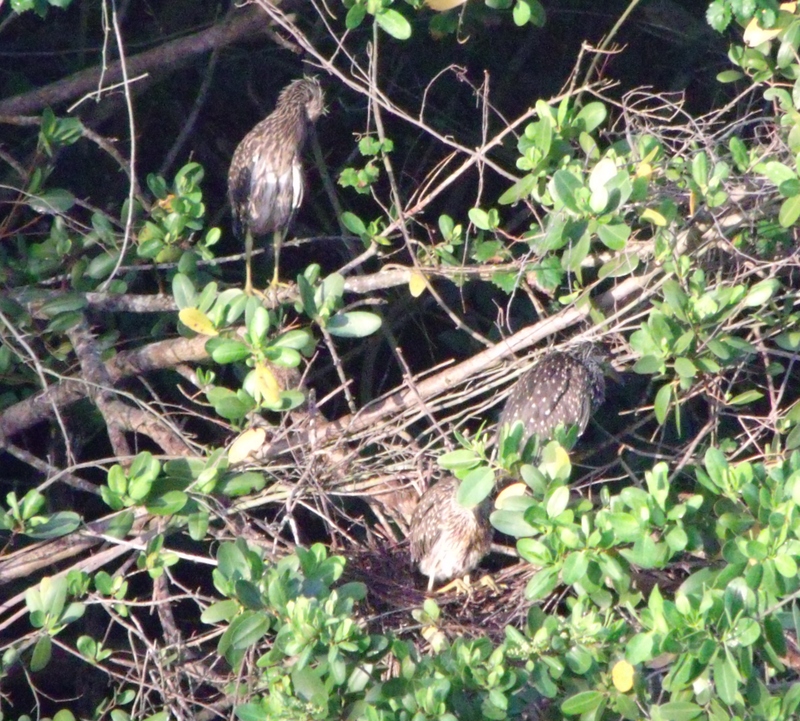 When they were finished we were fascinated by the “cloak of invisibility” the careful placement of the nest provided. Our stilt home turned out to be a great observation post. My wife and I spent hours watching the wonderful circle of life play out before us. 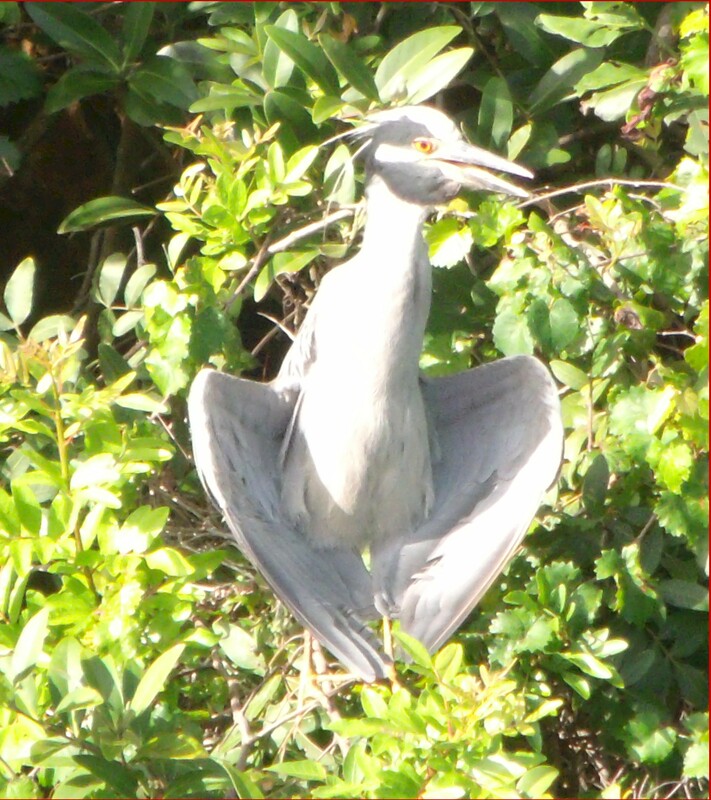 Each year since then, the Herons have returned … and I’m sure some of their off-spring have returned with them. We now have four active nests in the hundred or so feet of bushes across the canal. Watching them has been a great adventure. Each time they’ve had to re-engineer their homes, act as live counter-balances and shields as wind and rain try to destroy what they’ve made, guard and nurture the eggs (at one point they put an end to a blacksnake looking for lunch), hatch them, and feed the young. We’ve watched the young birds from the time they push from the shell until they make their first unsure flight. Besides the entertainment watching the Night Herons has provided, its strengthened me and improved my view of what the future may hold. 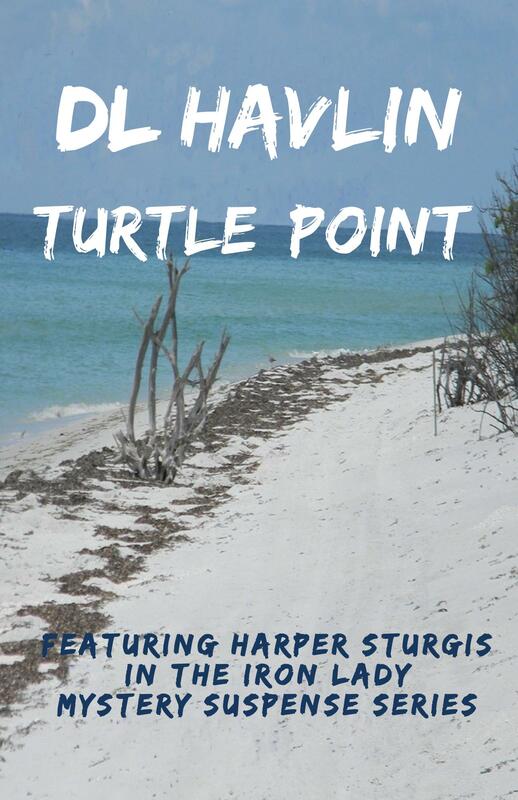 In the presence of human intrusion that adds to all the natural perils they face they persevere … they fight … they adapt … they live. In times such as we face it is important to know life will go on. If we humans persevere, fight and adapt like nature does, we’ll survive the fanatics, lunatic leaders, and our disappointments in government. 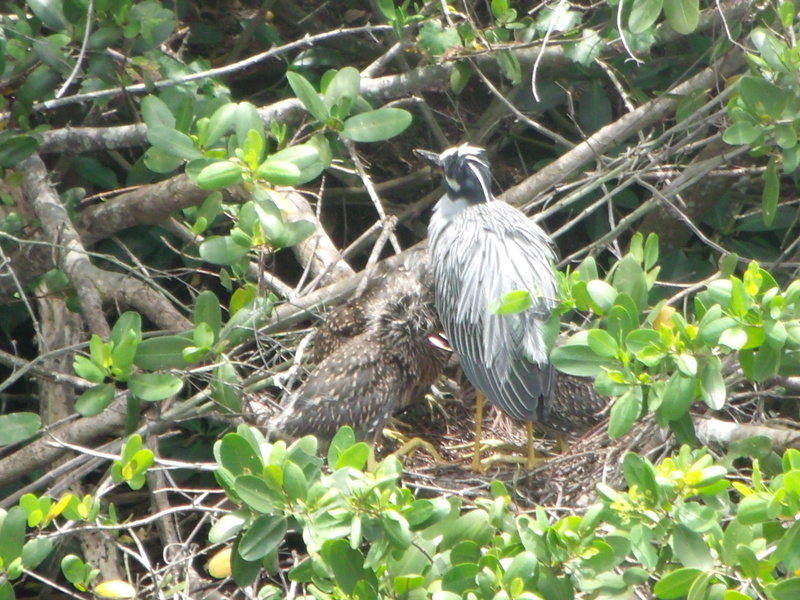 Babies Herons – nature provides feathers designed to hide them from enemies. Please share my sites with your friends and associates!! !